Dental Solutions Denture Clinic make and fit your dentures. Our bespoke dental appliances will transform your oral health and appearance. By visiting our clinic, you will regain your confidence and be free to smile again. Bring pictures of your smile, or a smile you would like to have, to your appointment and discuss with our CDT how together you can achieve your desired look. If you would like your new dentures to replicate all the favourable aspects of your existing dentures, then our Clinical Dental Technician can help you. From copying exact tooth position and shape, to improving the way they ﬁt. Your new dentures can be just like the dentures you have now only better. Dentures are a replacement for missing teeth. They can look just like natural teeth and are removable. They can be placed in the mouth and taken out with ease when required. The soft and hard tissues that make up the oral cavity support the device when it is placed in the mouth. We will make every effort to make and fit your dentures to your specification, giving you the choices in shape, shade, size and placement of your teeth. 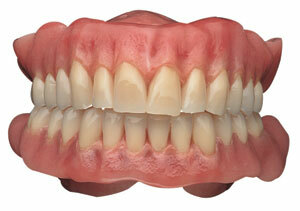 We can even make the gum on your denture look natural with gum shading. With advanced technology, dentures are more comfortable than ever before. While they do not feel exactly the same as natural teeth, they are a worthy alternative. We will be listening to you and discussing your options at every stage of your treatment. Chewing: Placing dentures over missing teeth dramatically increases the ability to chew. Aesthetics: Missing teeth can greatly affect a person’s appearance. Without teeth, the lips and cheeks are not supported and can appear to look sunken. Dentures fill out a person’s face and correct their smile. Pronunciation: Dentures can enhance people’s ability to speak. For certain words there is particular improvement in pronunciation. Self-esteem: Many people with missing teeth don’t like to smile and lack confidence. Well fitted dentures provide increased confidence to smile and more. If you have lost all of your natural teeth, dentures are an option for you. All teeth on the upper and/or lower arch of the mouth are replaced with the full denture. With full dentures there are several options, conventional, immediate and implant dentures. For conventional dentures, patients are left to heal following the removal of any remaining teeth before dentures are fitted. However, with immediate dentures, dentures are fitted immediately after teeth are removed, as the name suggests. For information on Implant dentures use the link on the navigation bar at the top of the page. For patients missing only a few teeth in the arch, partial dentures are a good option. They replace just the missing teeth and can be removed when required. Partial dentures are manufactured using two distinct materials, metal or acrylic. In some cases, a flexible acrylic denture may be an ideal option, for more information talk to our CDT. How to care for your Dentures? Dentures are very delicate and must be handled with extreme care. Dentures can easily break when dropped, so when handling them ensure you place a barrier between the dentures and a hard surface. For instance, if you are handling your dentures in the bathroom, stand over a sink of water, or alternatively place a folded towel on the surface. Dentures must always be kept moist, otherwise they will dry out. When you are not wearing your dentures, place then in either normal water or denture cleanser soaking solution. It is vital never to let your dentures soak in hot water, as it can make them warp. Just like your real teeth, dentures should also be cleaned daily. Using a soft denture brush, brush away any plaque or food deposits that have built up over the day. This will keep the dentures clean and stop them from becoming stained. Even if you don’t have any natural teeth left, it’s essential to still brush your gums, tongue and palate every day. The brushing removes plaque and stimulates the circulation in your tissues. In the unlikely event that your dentures chip, crack, break or become loose, visit your denture clinic straightaway. Attempting to fix them yourself could result in making the dentures damaged beyond repair. What is the lifespan of Dentures? It is important to visit your CDT at least once a year for a denture check-up. Over time, normal wear and tear will create the need for dentures to be relined, remade or rebased. Furthermore, the mouth experiences natural changes with age, which can cause your dentures to become loose, irritate your gums, or make chewing tricky. Dentures usually need to be relined every 3-5 years, or as your gums or mouth change and your current dentures become loose.